I'll be honest. I'm not feeling particularly thankful today. I have a cold. A horrible, horrible, cold. My nose is stopped up and raw from being blown so often, my lips are chapped from doing that awful 'I have a cold' mouth-breathing thing, my ears hurt and my sinuses.... My sinuses feel like....well, I don't even know what they feel like. They hurt. They throb with each beat of my pulse. I swear my cheeks are so swollen they're blocking my vision. Just glancing down at the keyboard makes me feel like I've been hit in the face with a brick. I've coughed so much even my arm pit muscles are getting sore. Generally, I feel really, really ughy. Have I mentioned that I don't do well with little illnesses? Child birth, ectopic pregnancies, broken bones, gall bladders..... no problem. Give me a Tylenol and I'll laugh at how bad it hurts and then get on with my day. But little illnesses like a cold, a hang nail or a paper cut.... and I become a huge puddle of pathetic. And that's where I am today. A huge, gigantic puddle of pathetic. And since I'm a huge, giant puddle of pathetic, I don't have much mental capacity for knitting anything the least bit difficult. 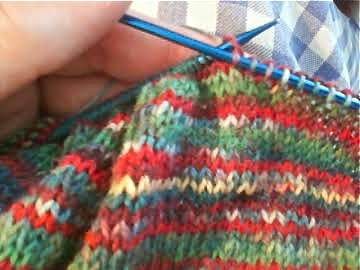 "Difficult" being anything more than knitting one stitch every few minutes. Luckily, I still have an "at work" project on the needles even though work is done for the season. It's a simple, all stockinette, knit in the round cowl. Pretty mindless and perfect for 'I feel ughy' knitting. And please, pardon the blurry photo. Coughing fits and photography don't go together too well. But I am thankful to have this very simple project already on the needles.